Vea la descripción del contenido mostrado a continuación. See description of content below. Page 1: Celebrating Women "Writing women back into history: the 30th anniversary of the National Women's History project" by Ruth A. González, and cover photo of Ana Gabriel. Page 2: Cartoon and ads for Multicultural Tae Kwon Do and Sonoma State University. Página 3: Anuncios; Page 3: Ads. Página 4: Personajes del Mes, Participantes del entrenamiento de Liderazgo del Sur de Santa Rosa del Otoño de 2009, "El Liderazgo sus residentes trae cambios en el sur de Santa Rosa" por Stephanie Sanchez, y "Las comunidades del condado de Sonoma no cuentan con opciones de alimentos saludables"
Page 4: People of the Month, Graduates of the South Santa Rosa Leadership Training, Fall 2009, "Resident leadership brings change to South Santa Rosa" by Stephanie Sanchez, and "Sonoma County communities lack healthy food options". 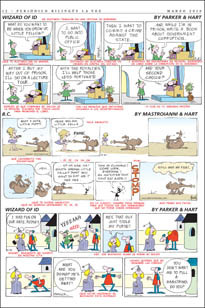 Página 5: Continuación; Page 5: Continuation of page 4. Página 6: Latinas Homenajeadas: Las latinas que han sido homenajeadas por el Proyecto de Historia Nacional de las Mujeres durante 30 años de "Writing women Back into History: (Escribiendo sobre el papel de las mujeres a través de las historia.)" Judith F. Baca, Linda Chávez Thompson, Felisa Rincón de Gautier, dolores Huerta, Jovita Idár, Tania León, María López de Hernández, Sonia Manzano, Vilma Martínez, Alicia Dickerson Montemayor, Graciela Olivarez, Nina Otero-Waren y Emma Tenayuka. Page 6: Honored Latinas: Latinas who have been honored by the Hational Women's History Project during 30 years of "Writing Women Back into History" from www.nwph.org. Judith F. Baca, Linda Chávez Thompson, Felisa Rincón de Gautier, dolores Huerta, Jovita Idár, Tania León, María López de Hernández, Sonia Manzano, Vilma Martínez, Alicia Dickerson Montemayor, Graciela Olivarez, Nina Otero-Waren and Emma Tenayuka. Page 7: Honored Latinas: Ellen Ochoa. Interesting facts about women. Page 8: Education. "Is your child an English learner" by Reina Salgado, Sonoma County Office of Education Parent Educator. Page 9: A poem about Bongos by Radha Weaver and "The Orchestra's Horn Section". 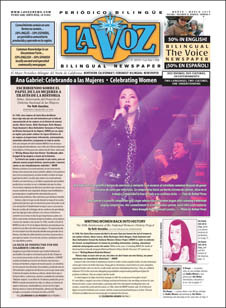 Page 10: "Beloved Mexican Musician, Ana Gabriel, Renovate or die!" by Ruth A. Gonzalez. Page 11: Questions and Answers for Ana Gabriel: by Rafael Pérez. Page 13: Sor Juana Inés de la Cruz, illustration by Emilio Rodríguez Jiménez; story by Ruth A. González. Página 14: Salud: "Fortaleciendo la parte central de su cuerpo" por Mónica Anderson;:y Cuidado de los Niños, "El mercurio, lindo pero venenoso," por Mark Netherda, MD y Walter Kruse; Nuestros Niños, "Celebremos a todos los niños" por Marisol Muñoz-Kiehne, PhD y Rona Renner, RN. Page 14: Health: "Core Strengthening: by Monica Anderson.and Child Care, "Mercury — Pretty But Poisonous," by Mark Netherda, MD and Walter Kruse. Página 15: Salud y Cuidado de los Niños, "Los Menores de edad y el alcohol," por Mary Maddux-González MD, MPH y Nuestros Niños, "Cómo elegir el cuidado infantil" por Marisol Muñoz-Kiehne, PhD y Rona Renner, RN. Page 15: Health and Child Care. "Underage Drinking" by Mary Maddux-González MD,MPH and Childhood Matters, "Choosing Quality Childcare" by Rona Renner, RN and Marisol Muñoz-Kiehne, PhD. Page 16: Fresh from the Market: "Mushrooms on the Menu" by Jill Nussinow, MS, RD, and recipe for Asparagus, Oyster Muchroom and Tofu Stir Fry. Page 17: Immigration, "H-1-B visas" by Christopher Kerosky, and SUDOKU answers. Page 18: announcements and Classified Ads.